Squibs And Crackers: Rock and Roll Devin! I've recently discovered a website called, 5 Minutes For Mom. It was created by identical twin mothers. The best part about this website is that any mother can participate. For example, every Wednesday (I will never learn how to spell Wednesday! I have to look it up every time! So usually I just use Weds. Anyhoo, back at the ranch) is "Wordless Wednesday" Participating mothers post their own photographs on their blogs and link it to 5 Minutes For Mom. I love that! Woman sharing their lives as mothers. So, here is my photo for Wordless Wednesday. Except, obviously, I'm definitely not wordless. 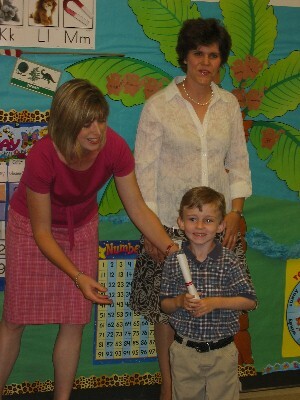 This is Ethan recieving his diploma as he graduates from preschool. Ethan loved his teachers. They are fabulous! This morning he said to me, "I'll miss my teachers when school is over." These teachers have been such a source of fun and learning for Ethan. Welcome to WW....very cute photos! oh. cute. cute. cute. That's it. We have to go out and see you. We haven't seen you in almost a year and we haven't seen you kids even longer.